Check out Tobi's Twilight Zone Corduroy Moto Jacket Corduroy and moto: a combo your closet needs this winter. You gotta get Blank NYC's Twilight Zone Corduroy Charcoal Moto Jacket. This is the perfect evening jacket for all your city romps. 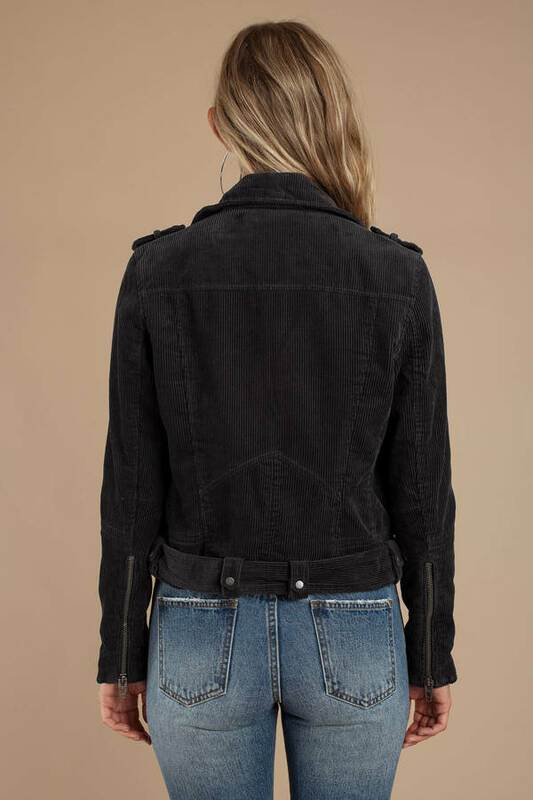 This vintage inspired outerwear features a front zipper, fitted sleeves, belt at the hem, and moto construction. Take this warm cord jacket out with your favorite fall dress and thigh high boots! Corduroy and moto: a combo your closet needs this winter. You gotta get Blank NYC's Twilight Zone Corduroy Charcoal Moto Jacket. This is the perfect evening jacket for all your city romps. This vintage inspired outerwear features a front zipper, fitted sleeves, belt at the hem, and moto construction. Take this warm cord jacket out with your favorite fall dress and thigh high boots!